This doesn’t stop me from goofing off. I think it actually encourages goofing off. 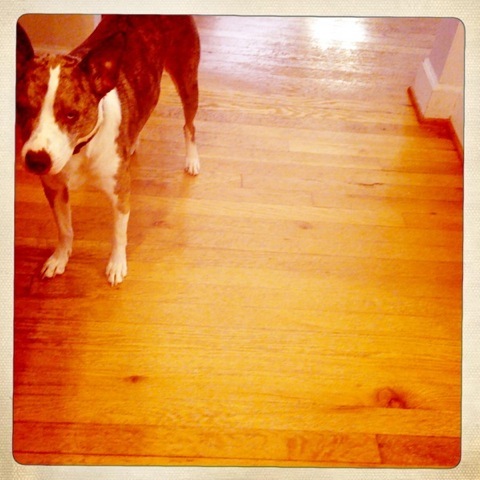 SO… After seeing the results on Jane Brocket’s page, I ran off and downloaded the Hipstamatic app for my phone. I can’t even stand it. It makes my wood floors presentable. It makes my neighborhood interesting. 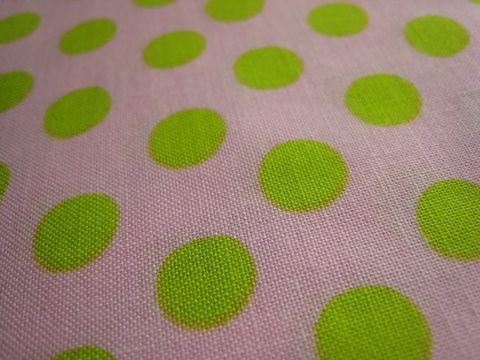 I don’t think it helps Sarah’s fabric look better. But it’s already as cute as can be. So I think adding the “camera” is something like a double negative. It does make the sewing machine look more quaint. I don’t know how I feel about what it does to the Alice in Wonderland Halloween treat bag I made. It is REALLY hard to get a decent pic of a tote bag anyway. Oh, and you’re missing the cute handles. Oh well. Maybe I’ll get the be-costumed one to model it in costume in the next little while. The tote bag was really fun to make — raw edge ruffle! There’s a whole coordinated Halloween thing going on over at Sew4Home. Most recently a bat mobile. Crack me up! Does the camera enhance the Joel Dewberry blocks for Liz? Are these pics making your eyes water a little bit? I don’t know. It’s a fun thing for a little while. The pics remind me of the ’70s. Yes, I was there. When Cindy Brady was just a twinkle in her mother’s eye. 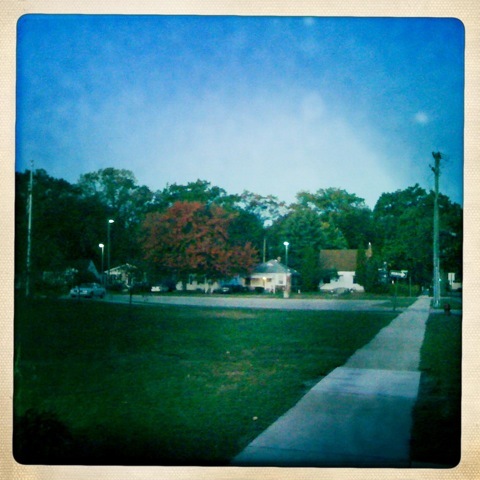 Gosh, it would be fun to see GOOD PHOTOS taken with the Hipstamatic. I’m making it work awfully hard to cover for my photography skillz. All right, rub that out of your eyes and wander over to Glorious Color so you can see a beautiful pic of Kim McLean’s Stars & Sprigs quilt. Go on, it will take you right back to the pretty present. June 6, 2009 at 7:19 am	· Filed under Dogs! 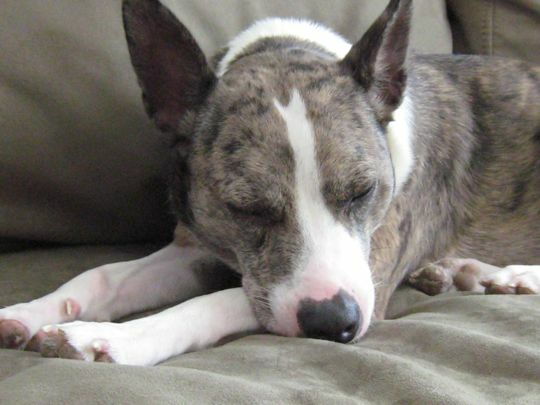 Just an update on the stray Boston terrier — her family claimed her at the animal shelter. Yea! Having had brief incidents with my own strays, I know how relieved they must be. Now it’s off to tend the fabrics and hopefully not get led astray among the bolts myself. That is, if I can wake up today. Feeling awfully creaky and tired today for some reason…or for no good reason other than aging? 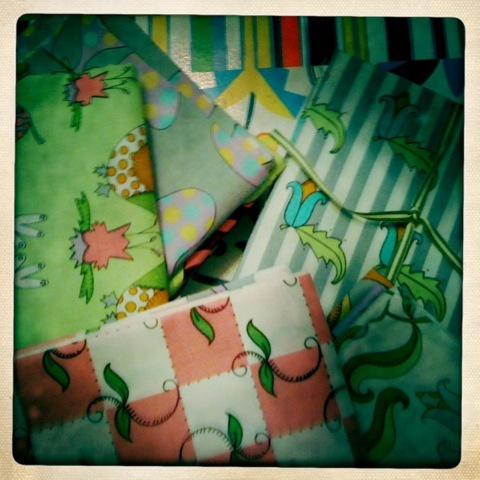 And don’t forget to enter the mass of SEWN giveaways before the deadlines! For any of you who remember the sale commercials: Open, open, open, open. Good. 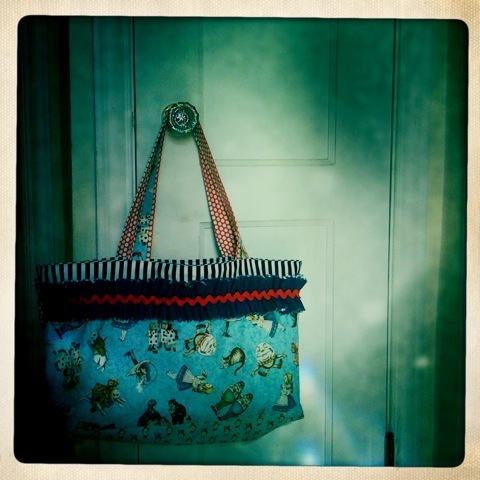 Had I not had a long session with the seam ripper today, I would be showing you the COMPLETED Savannah Satchel. Alas…maybe tomorrow. Instead, I want to tell you what happened the other day. My grandpa – my mom’s dad – died on Friday. I have been extraordinarily lucky to have had all four of my grandparents well into my adulthood–even my daughter has had them to an age when she can remember them well. This loss was especially hard for all of us. But a strange thing happened the day Grandpa died. We grew up with Boston terriers. He raised Boston terriers for a while. 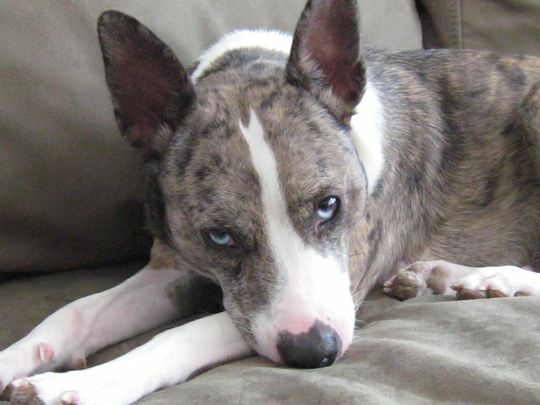 To us, there was no other kind of dog to have–Bostons were the best. I see more and more of them around my little town, but where my parents live, they are fairly uncommon. 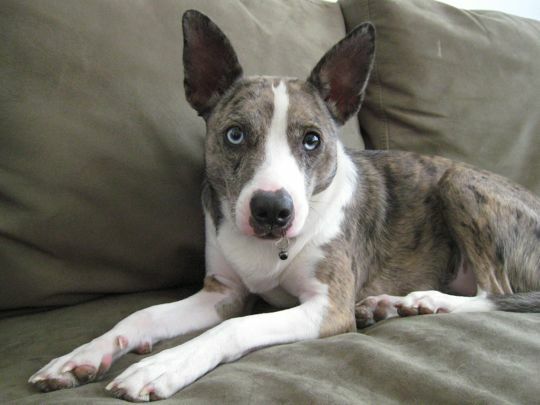 I was on the phone with my mom in the evening when a stray dog came up on her porch. Do you know what kind of dog it was? A stray Boston terrier appeared on her porch. It had a collar. It appeared well cared for and was very well behaved. My parents walked it around the neighborhood in hopes that the dog would lead them somewhere or someone would be out looking for this little dog. No one recognized it. They took it back home. At this time of day, the animal shelter was closed, but a police officer came and picked up the dog and took her to the animal shelter for the weekend. After the funeral on Monday, we called to check on the dog. No one had called to claim her by the afternoon. 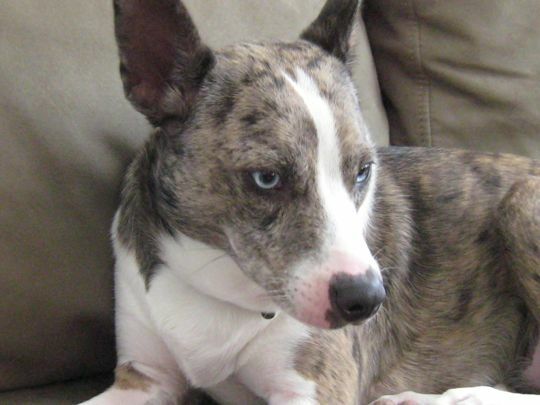 Where in the world did this little dog come from and where does she belong? Assuming no one claims her this week during her “stray” period, I’d like to think I know where she belongs. Generally, I don’t mind Mondays. I awoke bright and early with a good attitude. After all, it was lovely and I got to wear sandals and short sleeves. And then small things started going downhill. A girl might begin to think she was being conspired against. I went downstairs to start the day’s laundry. Yuck. The inside of the washer was covered in dirty stuff. Probably crumbling wood support beams or something minor like that. So, OK, do a rinse load to get that stuff out and start the actual laundry after walking the dogs. Note to self: For a variety of reasons, it is probably not a good idea to walk the dogs on the morning of garbage day (although I think it is their favorite day and time for walks..). The skittish-est of the dogs got out of her harness during a skirmish with some empty garbage cans. Mind you, the dogs wear harnesses instead of just collars during walks because they’ve both gotten out of their collars (see previous note re skittish dog…). I could see in her wee brain that she was trying to decide what to do with her newfound freedom. In the end, she crouched on the sidewalk and submitted to re-harnessing. I think a full-body harness is next. Upon returning home, I thought it was a good time for a fresh pot of coffee in the freshly washed coffee making apparatus. Mmmmmm….can’t you just smell it? AND CAN’T YOU JUST SEE IT FLOWING OVER THE COUNTERTOP AND ONTO THE KITCHEN FLOOR BECAUSE I FORGOT TO PUT THE POT UNDERNEATH?!?!? Sigh. I guess the kitchen rug needed washing anyway. But it is a lovely day, warm, sunny. Did I mention a tad windy? Gosh, I don’t even mind that I’ve had to retrieve the garbage cans about eight times. And then I met my arch-nemesis. The linen thread. I’ve stitched with this before. Ten blocks of decorative straight stitching, most recently. Just two more blocks to go and I’d be ready to pin a quilt. Even with the help of my able linen-stitching assitants, I am not yet done with the second block. Good heavens it is hard getting this stuff through the fabric! Those are finger cots, by the way. Oh well, there is still part of the day left. If I get these math books checked and some dinner made, I *might* get this quilt pinned. In the meantime, the granny square without end is about 30 inches across…with no end in sight. Kind of addictive. Except that my skin appears to be bothered by prolonged contact with metal (a crochet hook, for example…I guess I could wear finger cot protection…). And the rounds are getting prolong-ier. 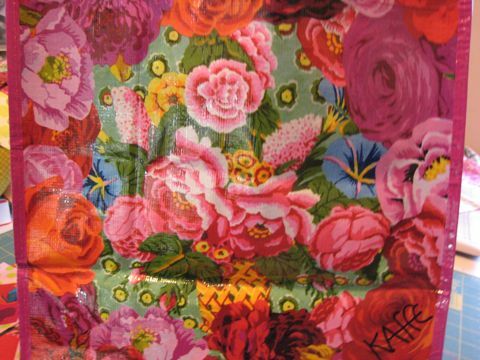 I was going to mention Kaffe scrap bags over at Glorious Color…but it looks like I didn’t need to mention it because they are sold out. 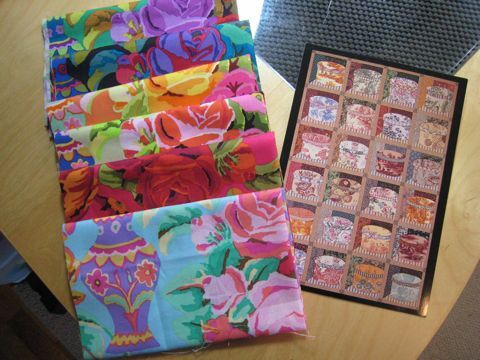 OK, then I will mention that they have Jay McCarroll’s fabric collection on sale. Oh, and I saw a really great new book over the weekend called Super Size ‘Em by Debbie Kratovil. 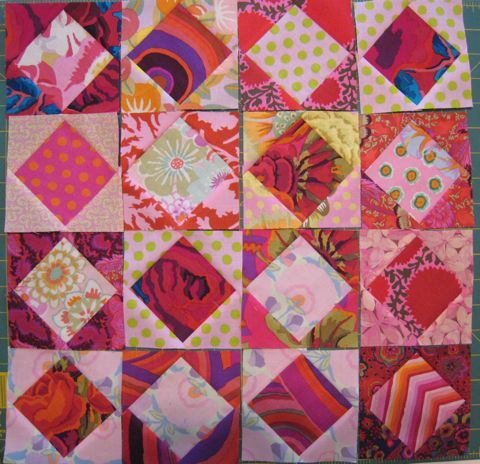 Great super-sized blocks that she shows with a lot of Kaffe fabrics (including a lovely Princess Feather). Ooooh aaaaah. I will definitely be adding this one to my book collection! If you’re having a Monday with a few bumps in the road, go listen to some Flight of the Conchords (caution: Hurt Feelings has a couple of bad words…) and you’ll surely cheer up. If you turn nine today, it may indeed be a beautiful day. Ah, well, it is a beautiful day. the mail man knocked on the door. He didn’t need to knock because the Amalgamated House Bear Society Auxiliary 253 had already announced his arrival (having previously announced the arrival of the wind blowing, a car driving by, a random member of the public walking by, and so on). I went to the door. Oh, he was bearing gifts today! I think I love you, Mr. Mail Man. Ahem. Gorgeous, no??? Very reasonably priced, IMHO. Look! Dividers for your breakables. I had to go next door to borrow a bottle of wine for demonstration purposes. What did you say? Did you say that I had to go next door to borrow an UNOPENED bottle of wine??? 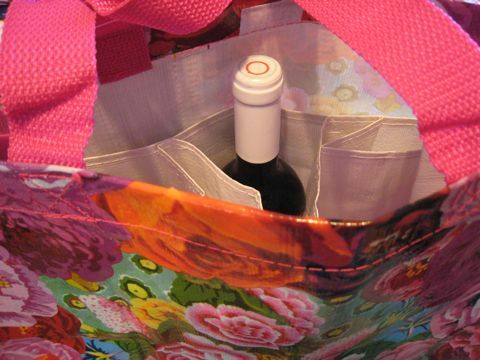 Well, between the Fat Sacks and the Kaffe tote, I think the case can be made for carrying the groceries home in a pretty way! 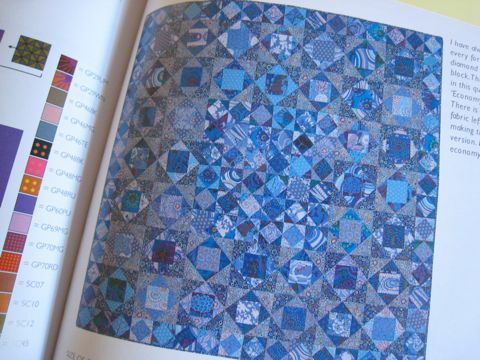 Liza’s Economy Blue Patch Quilt from Country Garden Quilts. Yep, this is certainly brightening things up around here! 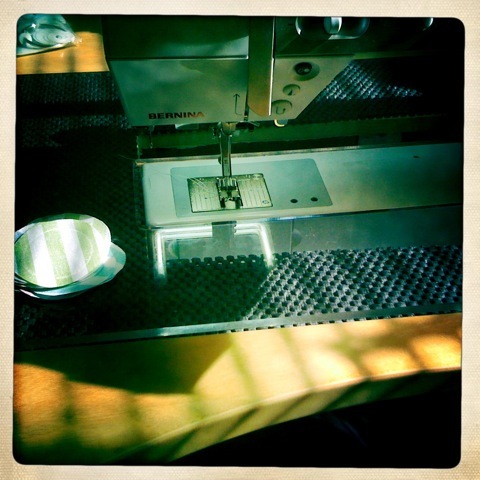 And I finished the hand quilting on the doll dress quilt and am stitching down the binding. Then to add the buttons and a label and put that quilt in the mail. 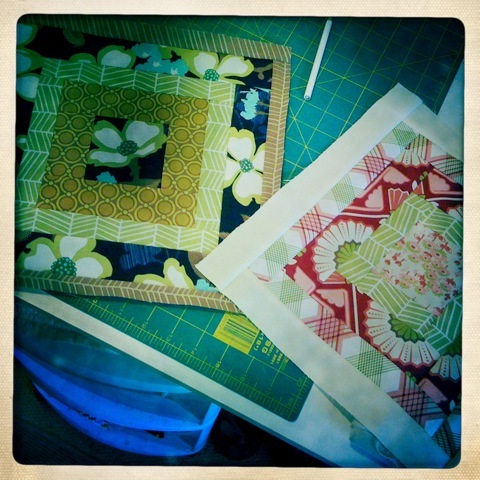 I haven’t done that much hand quilting in years, as you may know. While it felt like it was taking forever and a day to get that small piece done, I believe there may be more hand quilting in my future. 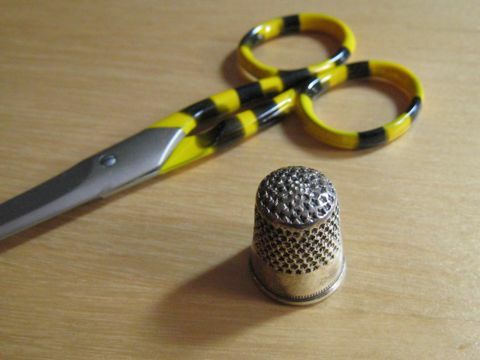 A girl will certainly be motivated to hand quilt if she knows she can use her “Sting” scissors and her thimble with stars. Sounds like a soup. May you find a bright spot in a November day. 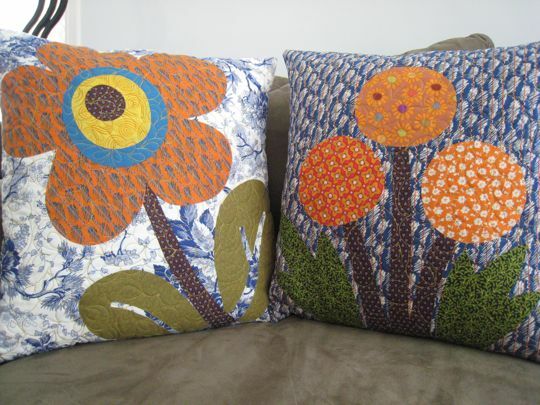 The dandelion pillows are finished. They make me wish I lived in a household that was cordial to pillows. Decorative pillows would reside on the dogs’ play structure (aka the living room furniture). 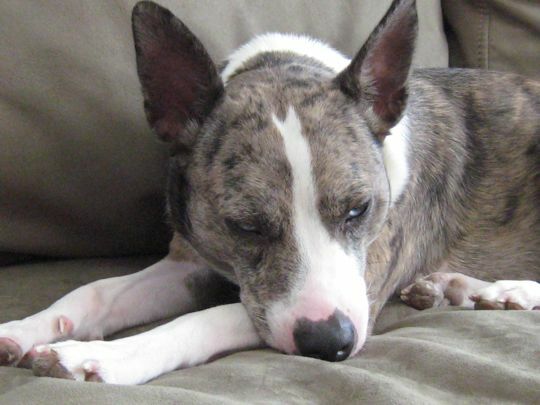 The pillows that came with the furniture were summarily chewed. They were test cases. We haven’t had decorative pillows since. Such a satisfying little project. I fused the appliques and DID NOT finish the edges. Instead I quilted tightly over the pillow surface. 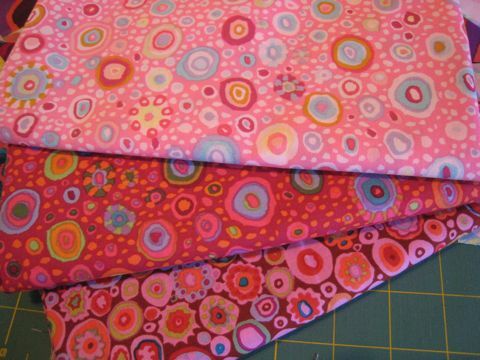 Here’s a good place to practice free-motion quilting without having to wrangle a quilt. Before I forget, why is it that pillow forms are so expensive? I don’t think I’ll ever be less than shocked when I see the price. Of course, I did not retreat to my basement of stuffing and make my own lumpy renditions of pillow forms. It’s just always puzzling to me…I also don’t get why rugs and lamps are so expensive. Notice I’m not complaining about the price of groceries or good shoes. Origami bookmarks. 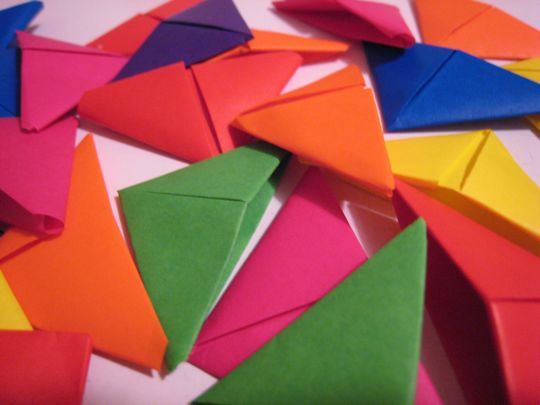 These are really fun to make–even if you’re making a whole classroom’s worth.